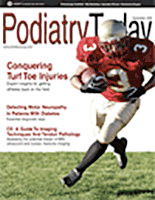 The treatment of painful hammertoes has dramatically changed in the past several years. What used to be a troubling and often difficult problem to correct has improved to the point that correction is consistent and there is far less pain and difficulty with the return to full function. Accordingly, let us take a closer look at a treatment algorithm for the treatment of hammertoes and associated problems. The underlying cause of hammertoes is not fully understood but the general thinking is quite simple. There is a noted imbalance between the stability of the flexor and extensor tendon function in the foot. In addition, there may be an associated lack of proper function of the intrinsic muscles of the foot, which adds to the instability of the foot and toes. The problem seems to be related to differing muscle imbalances in different types of feet. In high arch feet, there is a very strong extensor trying to dorsiflex the forefoot. This causes a buckling of the metatarsophalangeal joint (MPJ) and flexor contracture secondary to the dorsal MPJ motion. In flat feet, the problem is associated with increased function of the flexor tendons attempting to stabilize the flat foot. This results in hammering of the toes. Of interest is a third and less considered problem associated with a tear of the plantar plate at the associated MPJ with subsequent hammertoe formation and possible MPJ dislocation. For proper surgical correction, physical examination and proper testing are required. Initial testing requires adequate assessment of the function of the flexor and extensor tendons, stability of the associated MPJ joints and the rigidity of the hammertoe. Extensive testing is rarely required. The surgeon can use radiographs to check the position and level of deformity. One can also use radiographs to check MPJ alignment and evaluate for possible dislocation. If there is a suspicion of MPJ dislocation due to a plantar plate tear, use magnetic resonance imaging (MRI) to check the integrity of the plantar plate and intrinsic surrounding structures. Hammertoe correction involves multiple factors for adequate aesthetic and functional correction of the underlying deformity. In order to correct a hammertoe, proper alignment and stability are of primary concern. I prefer fusion procedures to arthroplasty in all but the first toe. This allows for better alignment, reduced edema and improved long-term position. Due to shoes and proper fit in shoegear, an arthroplasty of the first toe seems to work better than fusion procedures. A second point of great concern is ensuring good function of the toe with proper grasp of the ground and dorsal/plantar alignment. In such cases, one would perform hammertoe correction with sequential releases of the surrounding structures to correct the dorsal/plantar alignment. This facilitates proper ground purchase. The first structure one should release is the dorsal extensor tendon. If the toe is dorsiflexed, perform a release of the dorsal MPJ capsule. I prefer not to transect the extensor tendon and try only to lengthen the extensor if the dorsal MPJ capsule release is not successful. If the second metatarsal is too long, I will shorten the second metatarsal for proper toe purchase. If the plantar plate is torn, I will then perform a flexor tendon transfer. I find that this sequence leaves very few cases of uncorrectable deformity. The only time I find that correction is not possible with the aforementioned sequence is in cases of severe MPJ dislocation in which the only option for proper repositioning is an associated metatarsal head resection. Internal Screw Fixation: Is It The Best Option? While the aforementioned information is fairly well noted in the literature, recent advances in fixation have dramatically improved the results of hammertoe correction surgery. Fixation techniques such as use of K-wires leave a great deal to be desired because of the lack of rotation control and a lack of compression. Furthermore, following removal of the K-wire, there is often a contracture of the distal interphalangeal joint, which results in mild pain. Finally, with the K-wire protruding from the tip of the toe, showering and possible pin tract infection can cause problems for the patient. The three types of new fixation we have noted in our practice are absorbable pin fixation, headed and headless screw fixation, and internal bone fixation with implants such as the StayFuse (Nexa Orthopedics). I do not use the StayFuse. Due to the fact it is almost impossible to remove and does not stabilize the distal phalynx, it is not ideal for my needs. However, it is an excellent form of rotatory fixation and internal compression at the proximal interphalangeal joint. Absorbable pin fixation has been an excellent source of internal fixation in patients. The pin has a tendency to expand after it is in the bone. This procedure allows for mild compression forces and also provides mild rotatory fixation. However, absorbable pin fixation is best due to the ability to allow patients to shower after suture removal. I have noted some distal migration of the pins out the distal tip of the toe over time. This may require pin removal. However, this issue has been of little concern and one can do this with local anesthetic in the office as the pin tip is palpable. I have also found that the pins do not absorb in a timely fashion but this has not been a concern with my patients. The pin is easy to use and if one buries it well in the bone, distal migration is rare. My ideal form of hammertoe fixation has been internal screw fixation. I have used both the headed and headless screws, and still use both in certain situations. Overall, I have begun to use the headless screws far more often as they are easier to bury in the bone and the screw head also has a better screwdriver that has less chance of stripping. These screws allow excellent compression and rotation stability. They also stabilize the distal phalangeal joint in a rectus position. The headed screw has a very small head that at times has become stripped during placement. This requires screw replacement during the procedure to allow for removal at a later time. One can reduce the risk of screw head stripping by pre-drilling the screw hole to allow easier screw entrance. The headed screws are far easier to place as the screw head has a deeper screwdriver hole. Stripping of the screw head has not been a problem with the headed screws. The headed screws also allow full burial of the screw head, which significantly limits the need for screw removal. We have performed over 200 hammertoe screw procedures in our institute and have had no cases of screw breakage. The only limitation has been MPJ fixation. In these cases, one can place a pin from the dorsal MPJ into the toe. Otherwise, pin use may be necessary either along or through the center of the screw in a cannulated fashion only in non-weightbearing cases. Through the use of stable and rigid internal fixation, I have noted limited to no swelling of the toe, excellent alignment, a lack of nonunion and excellent long-term alignment and position. There is a small learning curve in utilizing screw fixation for hammertoe procedures. However, with a small amount of education, one can limit the difficulties that often occur with hammertoe corrections. Dr. Baravarian is an Assistant Clinical Professor at UCLA School of Medicine. He is the Chief of Foot and Ankle Surgery at Santa Monica UCLA Medical Center and Orthopedic Hospital, and is the Director of the University Foot and Ankle Institute in Los Angeles.